Epson, the number-one selling projector brand worldwide, today announced it has partnered with award-winning media artist and designer Refik Anadol to create two immersive projector installations blending light and art at the upcoming InfoComm Show in Las Vegas. Leveraging Epson’s new Pro L1000-Series large venue laser projectors, Anadol will demonstrate the new models’ high image quality and flexibility benefits in a unique and tangible way. The installations will be showcased at InfoComm in Las Vegas from June 8-10, 2016 at Epson’s booth, #C6333. Infinity: Using the Pro L1000-Series projectors, Anadol will construct an immersive environment designed to create a perception of presence in a non-physical world. The projectors allow Anadol to transform a conventional flat screen into a three-dimensional space of visualization. Cavity: Anadol will project images from the Pro L1000-Series on three printed surfaces, created with the SureColor T7270 44-inch wide printer. 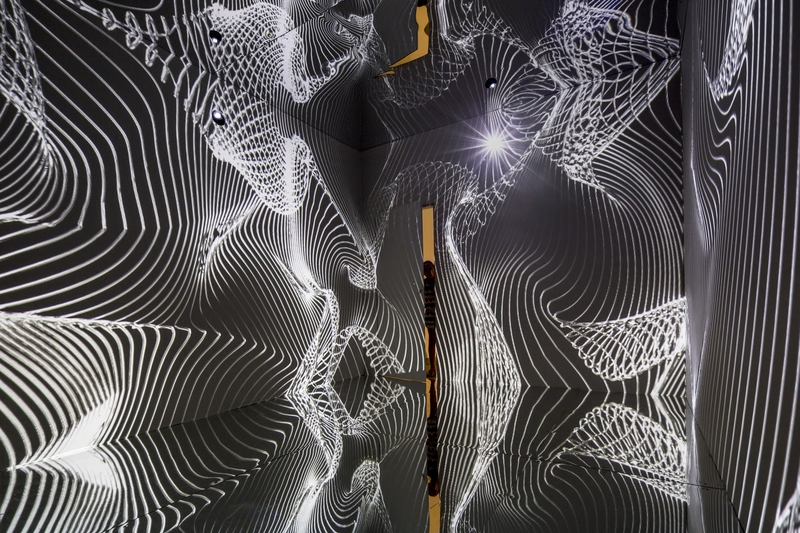 Exploring the ephemeral nature of space, this installation suggests that perhaps all spaces and facades have the potential to be used as artist canvases. Image Quality: With a highly efficient light engine, Epson’s 3LCD laser projectors can reproduce spectacular images with up to 12,000 lumens of color and white brightness1 and are ideal for large venues such as auditoriums, concert halls, lecture halls, and sanctuaries. Reliability: Epson’s LCD panels and phosphor wheel are made of inorganic material with superior light and heat resistance; combining these in a laser projector results in bright, vibrant images and up to 20,000 hours of virtually maintenance-free use, including 24/7 operation3. Flexibility: Epson’s lineup of 3LCD laser projectors is designed for a host of venues and applications; supporting 360-degree installation, edge-blending, stacking, portrait-mode projection, mapping, and a large variety of lens options. The Epson SureColor T-Series wide-format printers leverage Epson’s latest PrecisionCore® TFP® printhead and Epson UltraChrome® XD pigment ink, to provide technical, corporate and marketing professionals an unprecedented combination of precision, performance and brilliance. Available in both single- and dual-roll models, the SureColor T-Series delivers extreme line accuracy with resolutions up to 2880 x 1440 dpi at incredibly fast speeds. In addition, the SureColor T-Series 36- and 44-inch printer models offer an optional multifunction (MFP) module, enabling PC-free full color copy and scan capabilities – up to 36-inches wide – at best-in-class speeds for added convenience. Anadol is a media artist and director born in Istanbul, Turkey. Working at the forefront of digital art, Anadol’s work has been seen in exhibitions and projected on public buildings in Los Angeles; Santa Fe; Montreal; Geneva; Brussels; Herford, Germany; and Sydney, Australia. Anadol was born in Istanbul, Turkey and currently living and working in Los Angeles, Calif., he is a lecturer at UCLA’s Department of Design Media Arts. For more information, visit www.refikanadol.com. 2 Zero-offset ultra short-throw lens can be used with the Pro L1100U/NL, L1200U/NL, L1300U/NL, and L1405U/NL. 3 20,000 hours is the estimated projector life when used in Normal Mode. Actual hours may vary depending on mode and usage environment. The projectors come with a limited warranty of three years or 20,000 hours, whichever comes first. Note: EPSON, SureColor, UltraChrome, PrecisionCore,and TFP are registered trademarks, Epson Exceed Your Vision is a registered logomark of Seiko Epson Corporation. All other product brand names are trademarks and/or registered trademarks of their respective companies. Epson disclaims any and all rights in these marks.